Many come to Vail for the skiing or outdoor adventure only to realize the Vail Valley is an ample source of excellent restaurants. The countries largest ski destination may not have all the charm of Telluride, or the glitz of Aspen but two things Vail and Beaver Creek do have is great snow and delicious food! RentVAIL's owner Rob Rolland is a real pro when it comes to dining out. Listed below are Rob's two favorite restaurants in Vail and Beaver Creek. 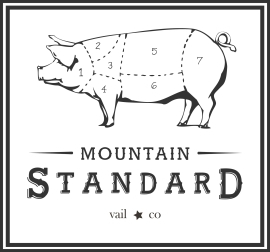 We highly recommend a meal at one of these fantastic options during your stay in the Vail Valley. A fresh, innovative and new Vail Colorado restaurant from the creators of the legendary Sweet Basil. The cuisine is modern American, with reasonable prices for the spectacular quality. On a scale of 1 to 10, the food is a 10. Stylish, rustic, relaxed, offering New American fare prepared over an open fire. A nice selection of beers, bourbons and more, in a woody space. This is a first class dining experience in Vail Village with a more casual vibe. Reservations can be made for parties of up to 6 people. Walk-ins welcome in the dining room. Full menu service at the bar on a first come first served basis. Please call the reservation line for parties of 7 or larger. You'll love the menu options at this high-end restaurant along with their over the top service. Enjoy what may be the best onion rings ever, wonderful salads, and main dished that include Walleye, beef, duck, lamb, and bison. Executive Chef David Gutowski from Peekskill, New York, has performed many culinary demonstrations with other guest chefs. Be sure to request his handmade Cavatelli and Braised Lamb. Located in the Pines Lodge in Beaver Creek, enjoy new American fine dining with mountain views and seasonal live piano music. Need some additional suggestions for places to find an affordable meal, a delicious hamburger or Rocky Mountain pizza? Give your friendly Concierge Services professionals at RentVAIL a call today, and we'll help you find a good place to eat.